This weekend (14-15 Jan), I took a trip from Berlin to Wrocław, Poland. I learned a lot about the history of the area, as well as the Jewish history of Poland, especially in Wrocław. It’s really some amazing and rich history that I’m excited to explore further. Here are some fun facts and observations. 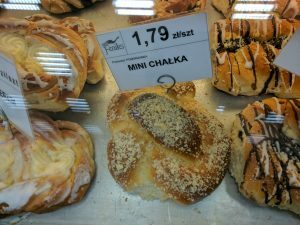 While exploring the grocery store, as I do in every city/country I go to, I found Chałka. What is Chałka, you might ask? It is the Polish word for bread just like Challah. This is just one example of how (Ashkenazi) Jewish culture is rooted here. It’s really amazing to see it firsthand rather than just learning about it in theory. Another thing I hadn’t greatly considered is how Poland changed in terms of its territory after WWII. The freewalkingtour.com site explains the issue the best. To paraphrase their analogy, imagine if the United States was Poland in WWII and Poland was fighting against Nazi Canada. Then imagine the Soviet Union of Mexico is the ally of the United States and has liberated the southern half of United States and then kept the territory. To compensate the United States for its losses to Soviet Union of Mexico (and because Nazi Canada was the aggressor), the southern 25% of Nazi Canada’s territory is given to the United States. Here, Toronto would be like Wrocław: a German city given to Poland as “payment” for the territories taken by Stalin.